Provides application cache with persistent storage, of which no replacement policy will be employed. Entries will only be deleted by explicit application control. Definition at line 32 of file in-memory-storage-persistent.hpp. Definition at line 26 of file in-memory-storage-persistent.cpp. 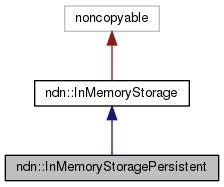 Definition at line 31 of file in-memory-storage-persistent.cpp. Definition at line 48 of file in-memory-storage-persistent.hpp.